✓ Vines with excess buds and leaves removed in the spring to aerate the strains and increase the leaf’s surface area exposed to the sun. ✓ Living soils, where microbial life creates organic soil enrichment through its regular twisted paths. ✓ Healthy natural conditions (altitude, exposure, and climate) allow for gentle methods necessary to the agriculture to maintain the vineyard’s perfect health. 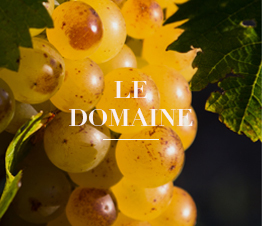 Decided in consultation between our winemaker Alain Sigaud and Xavier Vignon, renowned oenologist in charge of the production of our wines, the harvest is spread over 20 days. Each plot is harvested by hand, according to its maturity, several times if necessary, by the harvesters who separate the grapes so as to only press those that are mature and perfectly healthy. The wine-making process is the culmination of a year of work in the vineyards. During this year, men attempt to bring the skies, the soil, and the vines into perfect harmony. 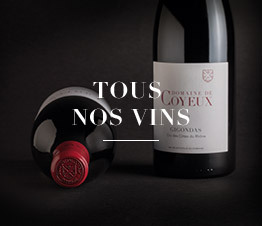 In this search for balance, Arnaud Immelé, international specialist in the production of wine without sulfite, lends his expertise to the Domaine de Coyeux to bring the vine to the glass. In the cellar, the steps between receiving the harvest and the fermentation vats are under the watchful eye of the winemaker. A malicious alchemist, he transforms the Gold of the grape into moments of Sharing and Spirituality.